Q: What is the upcoming live call schedule? All calls are at 11am ET/10am CT/9am MT/8am PT* and last one hour. Q: How do I access the membership site? To log in, go to https://relationallife.mykajabi.com/ . Click on any module tab along the top to view. Downloads are available on the bottom of the left column of each teaching segment. Q: What if I have a question but can’t attend the call live? You can use this form to submit a question to Terry before the live call. We understand you have busy schedules and live in many different time zones, so all the calls will be recorded and transcribed so you can listen to them anytime, as many times as you like. You will also be able to download the calls. The calls are uploaded into the membership, usually within two business days. Q: Are CEUs available for this course? The 5 CEUs offered are for the five live/recorded webinars from April 17th, 2019 – May 15th, 2019. You may only receive the CEUs if you viewed all five calls live or recorded. 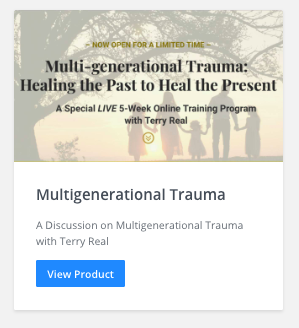 Multigenerational Trauma: Healing the Past to Heal the Present is approved for 5 CEU credits with the Boards below. Satisfactory Completion Participants must have paid course tuition fee, paid CEU fee (offered at the completion of the LIVE course), attended the entire seminar, and completed an evaluation in order to receive a certificate. On the days of the event, enjoy the LIVE webinar – our moderator will manage the webinar audience and confirm your attendance – there is no need to sign in/out like you would at a live in-person conference. No exceptions will be made. Partial credit is not available. R. Cassidy Seminars is approved by the American Psychological Association (APA) to offer continuing education for psychologists. R. Cassidy Seminars maintains responsibility for this program. 5 CE hours. R. Cassidy Seminars, ACE provider #1082, is approved as a provider for social work continuing education by the Association of Social Work Boards (ASWB) www.aswb.org, through the Approved Continuing Education (ACE) Program. R. Cassidy Seminars maintains responsibility for the program. Approval Period: April 15, 2015-April 15, 2018. Social workers should contact their regulatory board to determine course approval. Social workers participating in this course will receive 5 continuing education clock hours. Other States: If your state is not specifically listed, nearly all state Counselor, Social Worker and MFT boards accept either APA or ASWB approval, or are reciprocal with other state licensing board approvals, such as those listed below. Check with your board to be sure. The Ohio Board includes Social Workers. NY: R. Cassidy Seminars is recognized by the New York State Education Department’s State Board for Social Work as an approved provider (#0006) of continuing education for licensed social workers. This program is approved for 5 contact hours live. IL: Illinois Dept of Professional Regulation Approved Continuing Education Sponsor, #168-000141. (5) hours. MA: This activity has been certified by the Massachusetts Association for Marriage & Family Therapy, Inc. for professional continuing education. Certification #PC- 033964. MN: This course has been approved by the Minnesota Board of Marriage & Family Therapists for (5) hours of credit. Approval (2018-080). OH: Provider approved by the Ohio Counselor, Social Worker and Marriage and Family Therapist Board for (5) clock hours, #RCST11070. TX: Approved CE Sponsor through the Texas State Board of Examiners of Marriage & Family Therapists. Provider #151. 5 CE hours. NY: R. Cassidy Seminars is recognized by the New York State Education Department’s State Board of Mental Health Practitioners as an approved provider of continuing education for licensed creative arts therapists. #CAT-0005. (5) contact hours. TX: Provider approved by the TCBAP Standards Committee, Provider No. 1749-06, (5) hours general. Expires 3/31/2019. Complaints about provider or workshop content may be directed to the TCBAP Standards Committee, 1005 Congress Avenue, Ste. 460, Austin, Texas 78701, Fax Number (512) 476-7297. CA: Provider approved by the CA Board of Registered Nursing, Provider #CeP12224, for (5) contact hours. Many state nursing boards are reciprocal with other states. Check with your board to be sure. Q: How long is the course content available on the membership site? The content stays there for at least a year after the program ends, and you are welcome to download any material you like to save indefinitely. You can request to join the Facebook group by clicking here, and then clicking “join group” in the bottom left corner. Since it’s a private group, you’ll have to wait for your request to be approved. If your Facebook name is different than the name you registered with, please contact us at help@relationallifeinstitute.com. If you don’t have a Facebook account, you’ll need to create one in order to participate. Once your request has been approved, go to the group and introduce yourself in the Welcome Unit of the group. Q: I am having odd display or compatibility issues. How do I fix them? We’d hate for you to go, but understand life can get busy and situations change. If you are within 21 days of your purchase and would like to cancel, please send an email to terry@terryreal.com with “cancel” in subject line. Please consider sharing your feedback and make sure you provide the email that you used for registration if different then email you are using. Please email us at terry@terryreal.com. If this is technical issue (and to best support you), make sure you provide the following information: computer (mac or pc), browser (Firefox, Chrome, Safari, etc..), and url and any screen shot you’d want to share, and of course the issue. We are available Monday through Friday, and will usually respond to you within one business day.